Home / Golden Jubilee / Emmah Mankishi Mukokwe – District Commissioner encourages Mufumbwe UCZ Congregation to be soul winners. Emmah Mankishi Mukokwe – District Commissioner encourages Mufumbwe UCZ Congregation to be soul winners. MUFUMBWE: Mufumbwe Congregation of the United Church of Zambia started their celebration with a week of prayers every 17:00 hours (from 23rd to 28th June) with Saturday afternoon being the thanksgiving service. 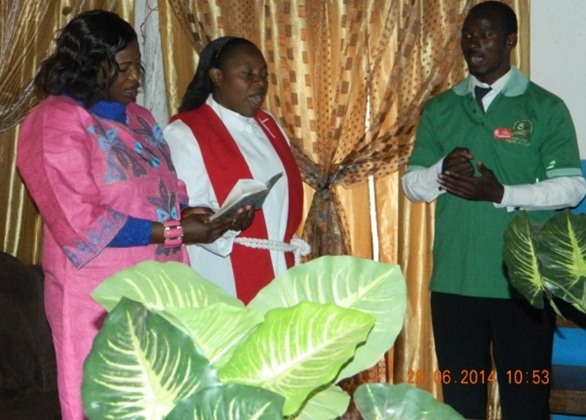 Congregants gathered at 08:00hours on Sunday for the worship service on 29TH June, 2014. The Minister – in- Charge Rev Royce Mutembo Siuluta flagged off the match past to mark the beginning of the celebration. From the church grounds, the matchers took the route through church road to the M8 (main tarmac) up to the station, and back to the place of worship. The Road Traffic Officer Mr. Shambala from Zambia police provided safety to the matchers. The Girls and Boys Brigades led the matchers, the members, followed by the Church office bearers. Jubilee songs from the Holy Angels choir and the praise team were sung through out the match past. Upon arrival at the Church, the Minister in charge took her position to receive the Golden Jubilee Banner, and then led the Congregants into the main Church. The celebration was graced by the District Commissioner, Mrs. Emmah Mankishi Mukokwe who was the Guest of honour. The Minister in Charge, Rev Siuluta welcomed the Guest of honour and ushered her into the church building. The local church History (the establishment of UCZ in Mufumbwe, and its pioneers) was read by the church secretary, followed by the General church history that was presented by the Minister (on the formation of United Church of Zambia). The Guest of Honour was then asked to address the congregants. She encouraged the congregants to be soul winners in fulfilment of the Great commission which the Lord Jesus Christ commanded his followers. She further admonished all believers to continue bearing much fruit. The whole celebration concluded with the sacrament of Holy Communion. The Minister later hosted luncheon in honour of the Guest of Honour. All congregants were invited for a meal and soft drinks.